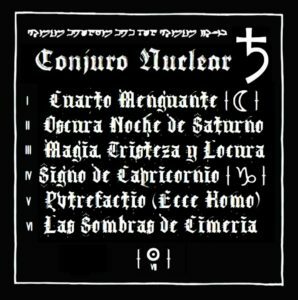 I got to know Conjuro Nuclear’s music when I reviewed the band’s sophomore album in 2014, self-entitled. The band’s music impressed me and I have decided to follow its artistic path and, so far, this Barcelona act has not disappointed me at all. In fact, instead of being stagnated, repeating itself in every single release or decreasing its quality, I have sensed that Conjuro Nuclear creativity and skills have developed through the years. The proof is ♄, the band’s latest work, from 2016. First, I would like to talk about the lyrics. The lyrical content of ♄ is incredible. It fits the music so well and they truly make you think. I find it much better when bands allow us to know what they are singing about; it is such an important complement to the musical work. In Conjuro’s case, they are in Spanish, but if you do not understand the language, the band has translated the all. 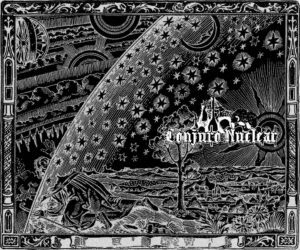 They are mystical, melancholic, esoteric, and philosophical. These are some of the words that can describe, in a very modest way, the amazingness of this album’s concept. Please, I invite you to check them, as they are true poems. You might need to do a bit of research to understand some of these concepts, but this is, in my humble view, a plus, since knowledge is power. 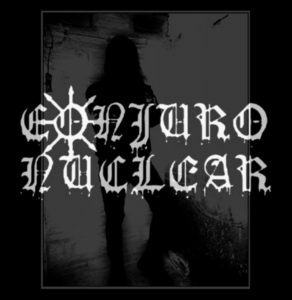 The band’s name, Conjuro, in Spanish meaning spell, does justice to the music crafted by Emesis. 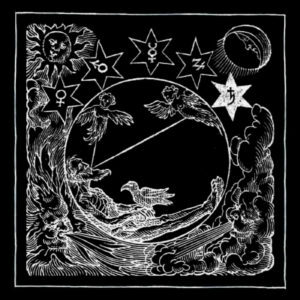 It is enticing, bewitching, blending several styles, most nobly Black Metal and Darkwave. Of course, the compositions are extreme, at many times very raw, but they are also dazzling and alluring. There is a feeling of those 70’s sci-fi depressive movies, which paints a desolate, lifeless landscape, almost weird, but fascinating. “Las sombras de cimeria” is a great example for this. Atmosperic, rich, melodic, ethereal, you feel like you are floating in a dream. In a mysterious, out-of-body experience, much like an astral travel. All in all, I wholeheartedly think that this is a great work. The rich atmosphere, the mythical state created by the band, the spell it casts in its endeavour truly captivates your soul. I have to add that ♄ is the kind of love it or not album. It is not for everyone. But if interesting, unique, experimental music is what you are looking for, I suggest you to listen to this magnificent effort.